by Chris Woodford. Last updated: December 31, 2018. Over, under, or straight through the middle? It's a simple-sounding question, but it's challenged every great engineer since ancient times. We like highways and railroads to be straight and level, but Earth's bumps and wiggles make that kind of construction an amazing challenge. How do you take a highway through a valley or make a railroad cross a creek? The simplest answer is to use a bridge. Sounds easy, perhaps, but which type of bridge do you use? Why are there so many different types and how do they all work? Let's take a closer look and find out more! Photo: One of the world's greatest bridges. Over 150 years after it was completed in 1859, Isambard Kingdom Brunel's amazing Royal Albert Bridge still carries railroad trains 30m (100ft) over the River Tamar, separating Cornwall and Devon in England. But is it a suspension bridge, or is it a truss bridge? Well, it's certainly a truss bridge (notice the thick, tubular, "lenticular" trusses at the top). The vertical ties running from the top curve ("chord") of the trusses, through the bottom curve, down to the deck mean that the bridge does not push outward on its supporting towers, though it does push its loads down onto them. But there are elements of other bridges in here too—bits of suspension bridge, bits of bowstring (tied-arch)—and I think it's a good example of how some bridges are actually hybrids incorporating several different types of bridge in one structure. A modern suspension bridge was built alongside in the 1960s to ferry cars across too (see the photos below). In the endless war of people versus nature, there will only ever be one winner—but humans can still console themselves with occasional victories, which is what the world's greatest bridges represent. Whether we need to cross rivers or valleys, connect islands to the mainland, carry cars, people, or manmade waterways, bridges are a brilliant solution whenever nature gets in our way. Historians suppose people invented bridges when they saw how fallen trees could help them cross shallow rivers. Since then, bridges have grown longer, technically more sophisticated, and much more awe-inspiring, slowly evolving from simple stone arches to gracefully swooping suspension bridges several miles long. Buffeted by winds from above, scoured by rivers from below, pounded by traffic all day long, it's a miracle that bridges stay upright as long as they do. Photo: Bridges do more than simply bear loads: with soaring towers and graceful spans, their inspiring designs are a triumph of architecture as well as engineering. 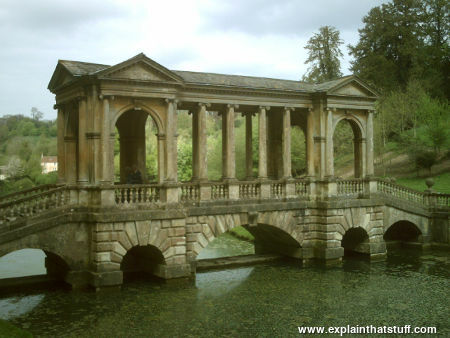 This is the Palladian Bridge at Prior Park, Bath, England, built in 1755, and reputedly one of only four such bridges in the world. You can see that the lower part of the bridge—essentially its deck—rests on five separate stone arches. Forces make things move, but they also hold them still. It's far from obvious, but when something like a skyscraper looms high above us or a bridge stretches out beneath our feet, hidden forces are hard at work: a bridge goes nowhere because all the forces acting on it are perfectly in balance. Bridge designers, in short, are force balancers. The biggest and most pervasive force in the universe, gravity, is constantly tugging things down, which isn't such a problem for a skyscraper, because the ground underneath pushes straight back up again. But a bridge spanning a river, valley, sea, or road is quite different: the huge deck (the main horizontal platform of a bridge) has no support directly beneath it. The longer the bridge, the more it weighs, the more it carries, and the bigger the risk it'll collapse. Bridges certainly do fall down from time to time, and quite spectacularly, but most stand happily still for years, decades, or even centuries. They do it by carefully balancing two main kinds of forces called compression (a pushing or squeezing force, acting inward) and tension (a pulling or stretching force, acting outward), channeling the load (the total weight of the bridge and the things it carries) onto abutments (the supports at either side) and piers (one or more supports in the middle). Although there are many kinds of bridges, virtually all of them work by balancing compressive forces in some places with tensile forces elsewhere, so there's no overall force to cause motion and do damage. Artwork: Balancing forces in a bridge: Different types of bridges carry loads through the forces of compression ("squeezing"—shown here by red lines) and tension ("stretching"—shown by blue lines): 1) A beam bridge has its beam partly in tension and partly in compression, with the abutments (side pillars) in compression; 2) An arch bridge supports loads through compression; 3) A suspension bridge has its piers (towers) in compression and the deck hangs from thick suspension cables by thinner cables, all of which are in tension. 4) A cable-stayed bridge is similar but the deck hangs directly from the piers from cables. The piers are in compression and the cables are in tension. 5) A truss bridge is a kind of reinforced beam bridge. Like a beam bridge, the top is in compression and the bottom in compression. The diagonal trusses are in tension and the vertical ones are in compression. 6) A cantilever bridge balances tension forces above the bridge deck with compression forces below. If a bridge is unloaded, all it really has to do is support its own weight (the dead load), so the tension and compression in its structure are essentially static forces (ones that don't cause movement), changing little from hour to hour or day to day. However, by definition bridges have to carry changing amounts of weight (the live load) from things like railroad trains, cars, or people, which can increase the ordinary tensile or compressive forces quite dramatically. Rail bridges, for example, bend and flex every time a heavy train crosses over them and then "relax" again as soon as the load has passed by. Bridges also have to bear ever-changing environmental forces. Arch bridges over rivers, for example, have to cope with water backing up behind them (their abutments often have strategically placed openings to let high flood water drain through). Suspension bridges that carry cars tend to bear the same loads all day long, though, often sited in windy estuaries, they also have to endure squalling gusts of wind, which can set up a twisting force, called torsion, in the bridge deck. (Modern suspension bridges tackle this problem by having decks with aerodynamically designed cross sections, tested in wind tunnels, and may be reinforced with trusses underneath.) Loads that cause a bridge to move back and forth can be particularly dangerous if they make it vibrate wildly at its so-called natural or resonant frequency. Resonance, as this is known, is what makes wine glasses shatter when opera singers get a bit too close; the "singing" of the wind can have equally catastrophic effects on a bridge. People find bridges bewitching and bewildering at the same time. Why are there so many different types? How do engineers choose one kind over another? Why have people tended to build different kinds of bridges in different periods of history? There's are easy answers to all these questions—and complex ones too. One simple answer is that, over thousands of years of human civilization, engineers have gradually developed more sophisticated bridge designs that can span ever greater distances. The oldest bridge types, beams and arches, can only stretch so far before they collapse under their own weight; more sophisticated versions of these designs (truss, box girder, and cantilever bridges) can reach further; and suspension and cable-stayed bridges can go further still. This gradual evolution—and extension—of bridges has been made possible partly by a deeper understanding of engineering, but also by the development of far stronger materials. Arch bridges were popular in the Middle Ages, for example, because they were quick and easy to build from locally sourced materials and lasted a long time with little or no maintenance. When Ironbridge, the world's first cast iron (arch) bridge, was built at Coalbrookdale in Shropshire, England, in 1779, it revolutionized bridge construction; during the 19th century, hundreds of other bridges were built from iron and later steel, including New York City's famous 1883 Brooklyn Bridge, with a span of 486m (1595ft). Suspension and cable-stayed bridges rely on those most dependable of modern materials, reinforced concrete and steel. Some of the newest bridges naturally use the very latest composite materials. While it's easy to discuss bridges in this fairly abstract and theoretical way, it's much more interesting to look at some specifics by examining each major type of bridge in turn. 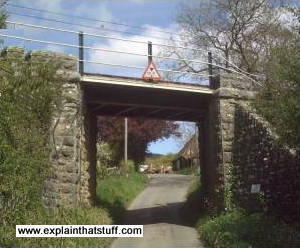 Photo: A beam bridge carrying a railway line over a road in Dorset, England. Note the abutment on the right-hand side that stops the bridge from collapsing down the hill toward us. A beam is the simplest (and often cheapest) kind of bridge: a deck, spanning a relatively short distance, held up by a pair of abutments (the vertical supports at either end). Stand on a plank (the deck) stretched between a couple of chairs (the abutments) and you'll make it flex downward in the middle, so it's slightly longer underneath and slightly shorter on top. That tells us that the bottom of a beam is in tension (pulled longer than it would ordinarily be), while the top is in compression (squashed shorter). The load on a bridge like this is transmitted through the beam to the abutments at either end, which are also compressed (squashed downward). The longer the beam, the more likely it is to sag in the middle, which is why basic beam bridges are usually quite short. Modern beam bridges can be much longer, if they're built with box girders (huge hollow boxes made from repeating sections of steel girders and/or reinforced concrete) or braced with trusses (diagonal reinforcements) either on the side or underneath. Beams are explained further in our article on how buildings work. 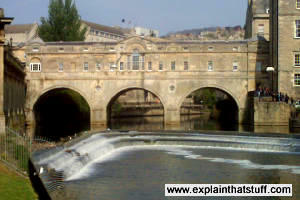 Photo: The Pulteney Bridge in Bath, England is made up of three stone arches. Completed in 1773, it's modeled on the Ponte Vecchio in Florence, Italy. Arches are the only kinds of bridges supported entirely by forces of compression. There is some tension underneath an arch, but it's usually negligible unless the arch is large and shallow. That makes sense, if you think about it, because an infinitely wide arch would just be a horizontal beam, with its lower side in tension. A bridge deck resting on an arch pushes down on the curve of stones (or metal components) underneath it, squashing them tightly together and effectively making them stronger. The load on a stone arch bridge is transmitted through the central stone (called the keystone), around the curve of other stones, and into the abutments, where the solid ground on either side pushes back upward and inward. Like beam bridges, arches are relatively simple and cheap to construct, and don't need to block a road or river with central piers. They can easily exceed the span of a basic beam, though their big drawback is that they need large abutments, so they're not always an efficient way of bridging something like a highway if a lot of clearance is needed underneath. Examples of arch bridges include the Mostar Bridge in Bosnia Herzegovina and the Charles Bridge in Prague. Photo: A truss bridge carrying a pedestrian walkway over a railroad line in Dorset, England. One way to extend the reach of a basic beam bridge is to reinforce it—and engineers have found the best way to do that is with a system of diagonal, triangular bars on the sides, which are called trusses. 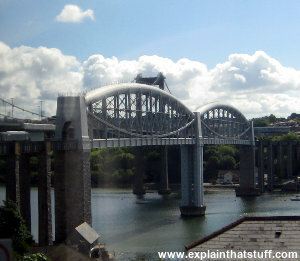 There are many ways of arranging trusses to support a bridge, giving a variety of intricate and often attractive lattice patterns; lenticular (curved) trusses, used in the Royal Albert Bridge in the top photo, are one example. A typical truss bridge looks like a hollow box with open or closed vertical sides and roof, the sides reinforced with diagonal trusses, and the base resting on girders. Photo: The Huey P. Long cantilevered bridge on the Mississippi River near New Orleans, under construction in the early 1930s. Note how the apparently unsupported spans at either end are extending outwards into thin air from the piers—the cantilever principle at work. Picture restored from an original by Marcus Lamkin courtesy of US Library of Congress. Two back-to-back beams extending outward from a pier can balance one another—just as a tightrope walker can balance by holding both arms straight out from her body. That's the basic idea behind the cantilever bridge. Normally, when we talk about a cantilever, we mean a beam supported at only one end, like a diving board or see-saw only much more rigid. In a cantilever bridge, there's usually a pair of cantilevers extending from each pier, with a short beam bridge in between, linking them together; alternatively, some have a cantilever extending out from each abutment toward the middle, with a beam bridging them. Cantilever bridges are sometimes hard to recognize because they're typically reinforced with girders and trusses, but easier to spot if you remember that they have multiple sections and often have at least one pier in the middle. The world's most famous cantilever bridge, the Forth Bridge in Scotland, has three cantilevers (reinforced with a lattice of trusses) with two shorter beam bridges in between them. The world's longest cantilever is the very similar Quebec Bridge, at just under 1km long (987m or 3239ft to be exact). 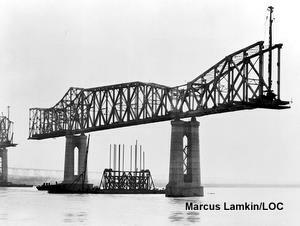 Other examples of cantilever bridges include the Queensboro Bridge in New York City and the Crescent City Connection in New Orleans. 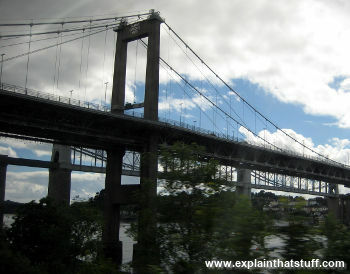 Photo: The Tamar Bridge, completed in 1961, spans the River Tamar, the boundary between Cornwall and Devon, England, alongside Brunel's 1859 rail bridge (from which this photo was taken). Notice the truss and girder reinforcements under the deck. If you need a bridge that spans even further, a suspension bridge of some kind is really your only option. The genius of a suspension bridge lies in using very tall piers with huge, curving main cables strung between them. Dozens of thinner vertical suspension cables of varying length hang down from the main cables and support the immense weight of the deck and the loads it carries. (And although people always notice the cables in a suspension bridge, they often fail to spot the girders and trusses reinforcing the deck underneath. This is a subtle and quite important point: most bridges are actually composites of two or more of the basic bridge types.) The biggest bridges all use the suspension approach; the world's longest, the Akashi Kaikyō in Japan, is 3.9km (2.4 miles) long. Famous suspension bridges include the Humber Bridge and the Clifton Suspension Bridge in England, the Golden Gate Bridge in California, and the Brooklyn Bridge in Manhattan, New York City. Photo: The Arthur Ravenel, Jr. cable-stayed bridge in Charleston S.C. Picture courtesy of Carol M. Highsmith's America Project in the Carol M. Highsmith Archive, US Library of Congress. A big drawback of suspension bridges is that they need to be anchored to the ground on either side. That's not always possible if there isn't room for the cables or appropriate bedrock to anchor them into. A different kind of suspension bridge, known as a cable-stayed bridge, does away with this by balancing two sets of suspension cables either side of each pier, which supports the load. In a "normal" suspension bridge, the deck hangs from cables of varying length that are themselves supported by the immensely strong main suspension cables. In a cable-stayed bridge, there's only one set of cables that fan out, diagonally, from each pier to the bridge deck, which tends to be stronger and bulkier than in a suspension bridge. Cable-stayed bridges are significantly shorter than conventional suspension bridges and generally don't span distances much greater than 1km; the world's longest is currently the Russky Bridge in Vladivostok, Russia, at 1.1km (3622ft). Other examples include the Vasco da Gama Bridge in Portugal, the Millau Viaduct in France, the Hangzou Bridge in China, and the Chords Bridge in Jerusalem. Photo: A pontoon bridge laid across the Euphrates River in Iraq. Photo by Kevin C. Quihuis, Jr. courtesy of US Marine Corps. Boats obviously float on water, so if you need to build a temporary bridge in a hurry, floating a deck on a series of boats is one possible solution. 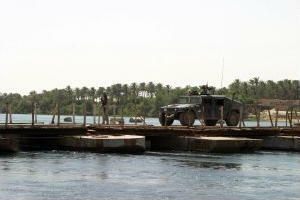 A floating bridge like this is called a pontoon—and it's widely used by the military for improvised river crossings (such as when existing bridges have been blown up for strategic reasons). Well-organized armies have prebuilt sections of pontoon bridges that they can float into place and bolt together, wherever and whenever they need to. The main problems with pontoon bridges are basic instability and the relatively light loads they can carry. Since the deck floats very close to the waterline, a pontoon bridge automatically blocks boats from using a river, though it's usually possible to detach a section or two from the middle and float it aside to let river traffic navigate through. Photo: Hell Gate Bridge, a through-arch railroad bridge in New York City, pictured around 1915–1920. Note how the bridge deck cuts horizontally through the arch (so some of the arch is above the deck and some below) and the big abutments at either end holding the arch in place. Photo by Detroit Publishing Co. courtesy of US Library of Congress. Hang a beam bridge from an overhead arch and what you get is called a through-arch bridge (if the deck cuts through the arch) or a tied-arch bridge (if the deck ties the arch in place at its base). Both kinds are a bit like suspension bridges, because the deck and its load hang from the arch. However, although they look very similar, they balance forces in different ways. In a through-arch bridge, just like with a conventional stone or brick arch, the ends of the arches push ("thrust") outward and need pushing back by the abutments. Bridges like this are sometimes called thrust arches for this reason. 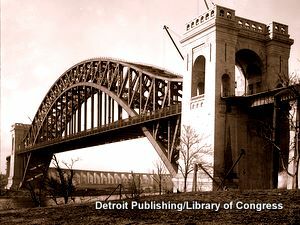 Examples of through-arch bridges include the Sydney Harbor Bridge in Australia, the Hell Gate Bridge in New York City (shown here), and the Tyne Road Bridge in Newcastle, England. 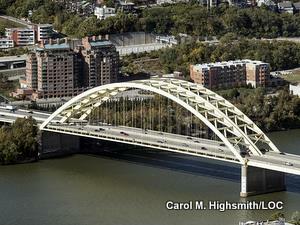 Photo: Daniel Carter Beard Bridge, a tied-arch bridge over the Ohio River. Note how the deck sits at the base of the arch (in the other words, the whole arch is above the deck) and ties it in place; for that reason, no big abutments are needed to hold the arch in place. Picture courtesy of the Carol M. Highsmith Archive, US Library of Congress, Prints and Photographs Division. In a tied-arch bridge, while the arch supports the deck, the deck also stops the arch from pushing outward, holding it in place, so the arch and deck balance one another. Just as a cable-stayed bridge is more self-supporting than a suspension bridge, because it does away with the anchoring cables, so tied-arch bridges are more self-supporting than a conventional arch, because they have less need for sturdy abutments. Tied-arch bridges are sometimes called bowstrings because they resemble the arch of a bow pulled out ready to fire an arrow, and because the crossbar ties the bow together in a similar way. Examples of tied-arch bridges include the Puente de la Barqueta in Spain and the St Georges Bridge in Delaware, USA. The Chaotianmen Bridge in China is both a through-arch and a tied-arch bridge. 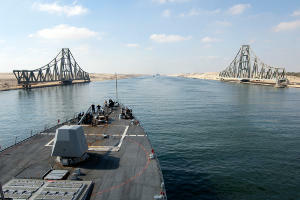 Photo: The El Ferdan Swing Bridge carries a railroad line over the Suez Canal in Egypt. Spanning 340m (1100 ft), it's the longest swing bridge in the world. Photo by Daniel Meshel courtesy of US Navy. Conventional bridges are impractical if something like a low road has to cross a river or canal through which tall boats need to pass. In that case, we need a mechanical bridge with a deck that can lift up or swing aside whenever necessary. Tower Bridge in London, England is a kind of double drawbridge: it has a split deck that lifts up in the center. There are many examples of swing bridges all over the world. Some have two moving parts that swing to the sides, leaving a central channel clear; others swivel on a central support to open up one or two clean channels of a waterway either side. Just as bridges balance competing forces from different directions, so engineers have to balance all kinds of considerations when they plan a new bridge. How far does the bridge need to stretch? That will usually determine the type of bridge that's needed. A very short span (over a small river, road, or rail track) could merit just a low-cost beam or truss; suspension and cable-stayed bridges will generally be unnecessarily complex and expensive; and arched bridges are built much less often than they were in the Middle Ages, partly because other types of bridges use the available space more efficiently. As we've already seen, the type of bridge determines the materials used, to a very large extent. Even so, there may be scope for using local materials so a bridge blends into its environment. That was certainly a feature of traditional arched bridges, often built from local rock or stone. Modern bridges are usually built from steel and concrete and have to rely on design to integrate themselves into their surroundings instead. Box-girder bridges are often manufactured in sections, off-site, which means they can be very rapidly erected. Unfortunately, it also tends to mean that they look very similar and generic. The place where a bridge is being built is also a critically important factor. Is the ground firm enough to take large abutments for an arch? Is there solid bedrock into which suspension cables can be anchored (and, if not, would a cable-stayed bridge be better)? If the bridge has to cross a river, how can piers and towers be safely sunk into its bed so they're not scoured away by the rushing water. The exact location of a bridge is carefully chosen to simplify construction, reduce cost, and ensure the bridge is strong and durable. It's not always possible for bridges to cross in a perfectly straight line, however; bridges sometimes have to cross at an angle (which gives what's known as a skew bridge), curve, or change direction from one section to another. Modern box girder bridges, built from modular deck sections, are easy to curve through even quite dramatic angles. Apart from the dead and live load, what kinds of occasional, transient forces might the bridge need to withstand? Are there earthquakes or hurricanes and, if so, how can the bridge be designed to survive them? Will a river bridge be able to cope with floods? And what about the loads it will carry? If it's a road bridge, how much is traffic likely to increase over the coming years and decades, and will the bridge always be strong enough to handle them? What if several of these transient forces occur at the same time? For example, suppose a bridge simultaneously has to handle high winds, immense pressure from rising water levels, and heavy traffic? Engineers have to consider all kinds of other factors beside the basic type, location, and strength of a bridge. For example, does a bridge have to carry different types of traffic (a railroad, cars, and pedestrians) and how will it separate them? What about safety considerations (stopping speeding cars from plunging over the edge), and issues like minimizing the risk of suicides (a particular problem for some of the world's tallest bridges)? What kind of maintenance will the bridge need, from regular concrete inspections to systematic painting to protect against corrosion? Science, technology, and engineering give us confidence we can build stone, iron, steel, or concrete bridges that will survive for many decades. But there's much more to a bridge than merely staying upright as humdrum loads shuttle over it. Think of some of the world's greatest bridges—the Stari Most arch at Mostar, the Brooklyn suspension bridge in Manhattan, the Forth Railway cantilever bridge, or the very recent, cable-stayed Millau Viaduct in France, for example—and you'll quickly realize that great bridges are as breathtakingly memorable as great buildings. Sitting in a river or straddling a valley, you could argue that a bridge disrupts the balance of nature. But bridges connect people and communities together, and many would contest that great bridges are true world wonders that enhance their environment. Who, for example, can imagine San Francisco Bay without the Golden Gate Bridge? So it's maybe just as true to argue that the genius of a great bridge lies in forging a partnership between people and place so that engineering and nature sit happily, side by side. Bridges don't fail very often, but when they do, the results are spectacular and unforgettable. Once you've seen the footage of the Tacoma Narrows bridge resonating in a gale, bucking back and forth before the deck breaks up and crashes to the river below, you'll never forget it. Imagine how terrifying it would have been if you'd been on the bridge at the time! Bridges always collapse for exactly the same reason: something happens that makes them unable to balance the forces acting on them. A force becomes too great for one of the components in the bridge (maybe something as simple as a single rivet or tie-bar), which immediately fails. That means the load on the bridge suddenly has to be shared by fewer components, so any one of them might also be pushed beyond its limit. Sooner or later, another component fails, then another—and so the bridge collapses in a kind of domino effect of failing materials. Photo: This is the remains of the I-35W Mississippi River bridge, a steel-trussed arch bridge that used to carry a very busy highway over the river. 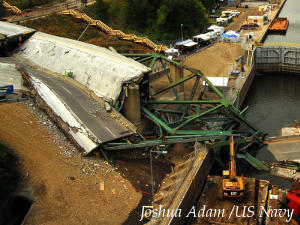 It collapsed unexpectedly in 2007, killing 13 people and injuring 145 more. 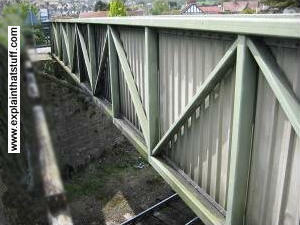 A report into the disaster found that a metal plate had ripped along a line of rivets, causing a catastrophic failure. Ironically, the bridge was carrying a massive extra load of construction equipment for repairs and reinforcement at the time. Riddled with fatigue cracks and corrosion, it had been deemed "structurally deficient" as far back as 1990. Photo by Joshua Adam courtesy of US Navy. There are two different ways in which a bridge component can fail catastrophically: weakness and fatigue. First, and simplest, it might be too weak to cope with a sudden transient load. If a bridge is designed to carry no more than 100 cars, but 200 heavy trucks drive onto it instead, that creates a dangerous, transient load. Or if hurricane-force winds buffet the bridge, twisting the deck much more than it's designed to cope with, that can be catastrophic too. So a bridge can fail through weakness because a force exceeds what's called the ultimate tensile strength (the most you can pull) or compressive strength (the most you can push) of the materials from which it's constructed. But a bridge can also fail even if the forces on it are relatively modest and well within these limits. Everyday materials usually have to undergo repeated stresses and strains—for example, a bridge deck is loaded (when a truck drives across) and then unloaded again immediately afterward, and that can happen hundreds or thousands of times a day, hundreds of days a year. Just as a paperclip snaps when you repeatedly bend it back and forth, the endless cycles of stress and strain, flexing and relaxing, can cause materials to weaken over time through a process known as fatigue. Eventually, something like a metal cable or tie in a bridge will snap even though it's not experiencing a particularly high stress at that moment. Fatigue is often compounded by gradual corrosion (rusting) of metal components or what's informally known as concrete cancer (such as when reinforced concrete cracks after the metal reinforcing bars inside it start to rust). Engineers try to protect against bridge failures in two main ways. If we learn to see bridges as "living structures," constantly aging and being degraded by weather and the environment. it's easy to understand that they need regular maintenance, just like our homes and bodies. Periodic inspections and preventative maintenance helps us spot problems and correct them before it's too late. Engineers can also protect against bridge failure by building in a factor of safety—designing them so they can cope with forces several times larger than they're ever likely to encounter. That might include extra "redundant" components or reinforcements so that even if one part of the structure fails, others can safely share the load until the bridge can be reinforced or repaired. Why did the bridge collapse? by Elizabeth Stawicki. MPR News, Aug 2, 2007. A very interesting article exploring the reasons for the I-35W Mississippi River bridge collapse. Why Buildings Fall Down by Matthys Levy and Mario Salvadori. Norton, 2002. Chapter 7 "Galloping Gertie" explores the Tacoma Narrows bridge collapse and Chapter 9 "Thruways to Eternity" looks into the Mianus River bridge fall in 1983. Bridge Engineering by Jim J. Zhao and Demetrios E. Tonias. McGraw Hill Professional, 2012. A nitty-gritty book for bridge designers (and armchair engineers), with many case studies, illustrations, and photos. Bridges of the World: Their Design and Construction by Charles Smith Whitney. Courier Dover, 2003. Covers the design and history of bridges with lots of examples and many illustrations and photos. Bridges: Three Thousand Years of Defying Nature by David J. Brown. Mitchell Beazley, 2005. Another really nice book, written in easy-to-follow magazine style with plenty of text, well supported by hundreds of good illustrations and photos. Bridges: Heroic Designs That Changed the World by Dan Cruickshank. HarperCollins, 2010. A celebration of bridges from one of Britain's best-known architectural historians. I read this recently and highly recommend it. Structures, or, Why Things Don't Fall Down by J.E. Gordon. Da Capo Press, 2003 (reprinted in many different editions since the 1970s). James Gordon's excellent books on materials and structures have been delighting science and engineering students for decades. He writes with an engaging humor and keeps his explanations simple and interesting without dumbing down in any way. Building Bridges: Young Engineers by Tammy Enz. Raintree, 2017. Covering much the same ground as my article, but for a younger audience (ages 6–9). 32 pages with copious photos. Structural Engineering: Science Builders by Tammy Enz. Capstone, 2017. This 48-page book is for a slightly older audience (perhaps 8–10) and explains engineering principles with the help of seven, simple, science-based projects. The World's Most Amazing Bridges by Michael Hurley. Raintree, 2012. A 32-page guide for ages 8–10 that focuses on a good selection of famous bridges, including up-to-date examples like the Millau Viaduct and classics like the Golden Gate. World's longest sea crossing: Hong Kong-Zhuhai bridge opens: BBC News, October 23, 2018. A remarkable new bridge opens between Hong Kong and the Chinese mainland. Best foot forward: the world's most striking pedestrian bridges by Antonia Wilson. The Guardian, July 30, 2018. A bridge held up by two hands... and several more exciting examples of amazing bridge architecture! Rising high but buried in debt by Chris Buckley. The New York Times, June 10, 2017. China is opening around 50 new bridges a year, but paying for them isn't proving easy. 3 New Bridges Rise in New York, With Looks That Could Stop Traffic by David W. Dunlap. The New York Times, April 27, 2017. The story behind New York City's latest cable-stayed bridges. A Replacement Bridge Rises on the Bay: New York Times, February 6, 2012. How the San Francisco-Oakland Bay Bridge has been designed to withstand earthquakes. Building Big: Akashi Kaikyo Bridge: A simpler introduction to the bridge and a few more facts and statistics. World's Longest Suspension Bridge Opens in Japan: A much more technical and detailed article about the Akashi Kaikyō by bridge engineer James D. Cooper. The Potato Arch by Dave Ansell, The Naked Scientists. How to build your very own arch bridge from a potato! A great hands-on demonstration of why arches actually stay upright and support loads. The Effect of Bridge Design on Weight Bearing Capacity by Terik Daly and Andrew Olson, Science Buddies. Build some different kinds of bridges and see which can carry the most weight.